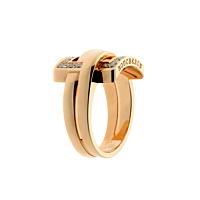 This unique Boucheron designer ring has a bold style all its own. Round brilliant cut diamonds are set in the square halo. The double bands in rose gold weave in and out of the halo, creating a three-dimensional feel and a look that is anything but ordinary. Set in the warmth of the rich rose gold, the diamond accent stones in this ring appear exceptionally white. The contrast of the diamonds and metal create an eye-catching effect. This contemporary piece is a must-have ring for your designer collection.